A gall is an abnormal growth produced by a plant or other host under the influence of another organism. It involves enlargement and/or proliferation of host cells and provides both shelter and food or nutrients for the invading organism. 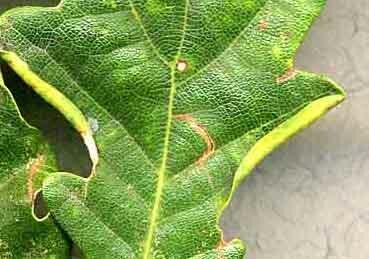 Agent: Neuroterus albipes Gall wasp (Asexual) on the underside of the leaf of English oak. Photographed September 2000. They are uncommon. Agent: Neuroterus numismalis Gall wasp (Asexual) on the underside of the leaves of English oak. Photographed 2 August 2001. They were uncommon in 2006. 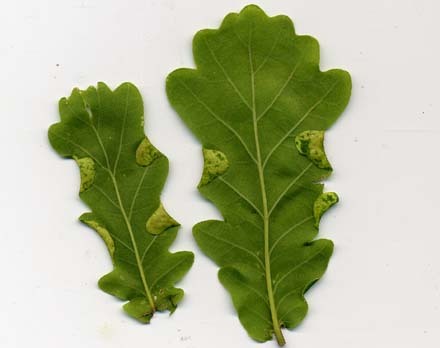 SMALL RAISED GALLS Agent: Neuroterus numismalis Gall wasp (Sexual) Right: Top of leaf gall showing radiating lines Photo: 28th May 2013. Agent: Andricus testaceipes Gall wasp (Asexual). On lower stem of sapling of English oak. A secretion is attractive to ants. On Latchford Meadow. Photographed 20th August 2005. Agent: Biorhiza pallida Gall wasp (Asexual) On root of English oak. Photographed March 1983. Andricus quercusradicis (asexual) on the roots of a sapling English oak. Some old Barnacle galls can be seen on the lower stem at the top of the picture. Photo: 6th May 2006.
a plenty on an English oak near the Hainault Oak entrance. Photo: 15th May 2006. Agent: Biorhiza pallida Gall wasp (Sexual) a bud gall developing before the leaves on English oak. Photo May 2000. Agent: Biorhiza pallida Gall wasp (Sexual) an old gall on English oak with many exit holes August 2000. Agent: Andricus aries Gall wasp On English oak. 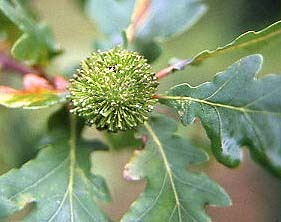 I took the photograph in early August 2000, which was later identified by David Savage of the British Plant Gall Society and was the first record for Hainault Forest. Agent: Andricus aries Gall wasp Photograph taken on 28th August 2001. 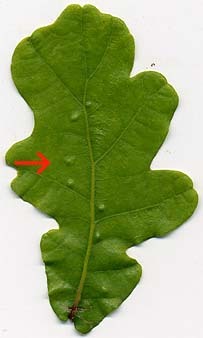 Very common in 2005 on English oak. Agent: Andricus aries Gall wasp Little is known of its life history. Shows exit hole. Photographed 10th May 2002. Agent: Andricus grossulariae Gall wasp (Sexual) on male catkins of Turkey Oak Quercus cerris. New Essex record 2004. Photographed May 22 2005. GALL on ACORN CUP Agent: Andricus grossulariae Gall wasp (Asexual) on acorn cups of English Oak Q.robur. Changes from red to green during development. Photographed August 2005 (left) and October 2004 (right). First reported in Berkshire 2000. SMALL PEA GALL Agent: Cynips divisa Gall wasp (asexual) on the underside of the leaves of English oak. Common in 2001. Left photographed June 2001. Right shows exit holes photographed Sept. 2000. Gall wasp (Asexual) on acorn of English oak. Left: Old gall brown colour. 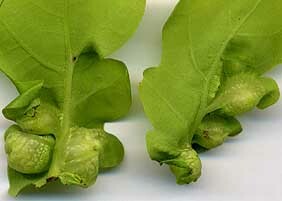 Middle: Gall turning from green to red. 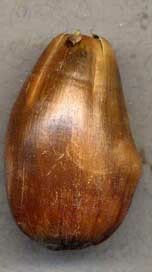 Right: The Knoppers are enclosing the acorn. All photos: August 2000. Very common 2004. Agent: Andricus inflator Gall wasp (Asexual) within the bud of English oak. Photographed August 2002. Uncommon. 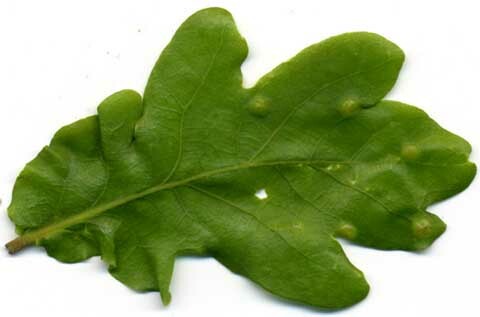 Agent: Andricus inflator Gall wasp (Sexual) on English oak. BUD GALL Agent: Andricus solitarius Gall wasp (Asexual) on English oak. Photographed 7th June 2007. In the early stages it is covered in golden hairs. Mature BUD GALL of Andricus solitarius. Photographed July 13th 2005. Compared with previous picture the gall has lost the hairs. TIGHT UPWARDS ROLL between lobes. Agent: Macrodiplosis volvens A midge On English oak. Gall wasp (Asexual) on the underside of the leaf of English oak. Green at first, then red, usually one on the underside of leaf, but in this case six! Photo: ©Iris Newbery. August 1999. Gall wasp (Asexual) on the underside of the leaf of English oak. Photo: June 2001. They are uncommon. Gall wasp (Sexual) a leaf gall on English oak which thickens and distorts leaf or midrib. Photographed 20th April 2007. 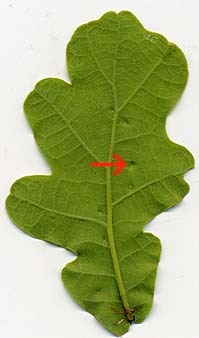 Oak gall Andricus curvator (sexual generation) distorting leaf. 13th June 12. Gall wasp (Asexual) a bud gall on English oak. Photographed August 2000. Common in 2001. 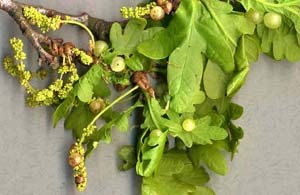 Gall wasp (Asexual) affects the budsof English oak. Common on scrub oak. Turns brown in Autumn when the wasp emerges. Persists on the twig. Photographed June 2000. 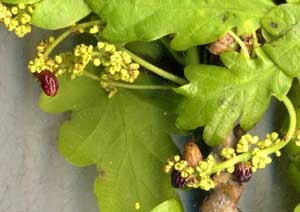 COLA NUT GALL Agent: Andricus lignicola Gall wasp (Asexual) affects the buds of English oak. Old galls persist on the twigs. Photographed August 2001. Common in 2001. 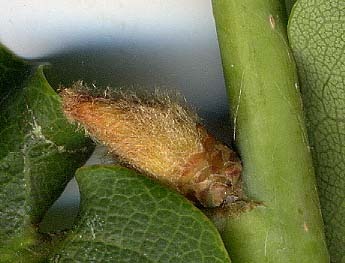 A new gall in the UK 2006. 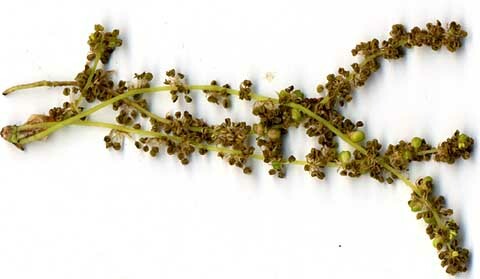 Agent: Neuroterus saliens Gall wasp. Left - Sea anemone gall in female flower (Sexual generation) Photo: 13th May 2006. 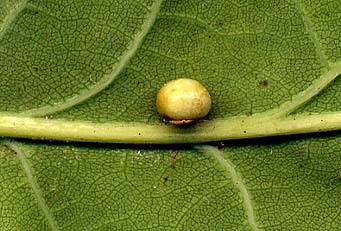 Right - Galls 3mm. 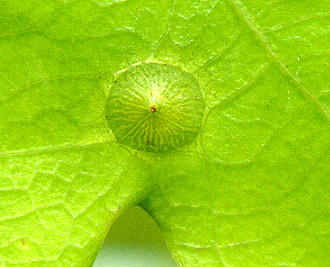 on midrib (both surfaces) and leaf petiole. Photo: 15th October 2006. (Asexual generation). Both photographs taken from the same tree on Hog Hill. Both generations on Turkey oak. 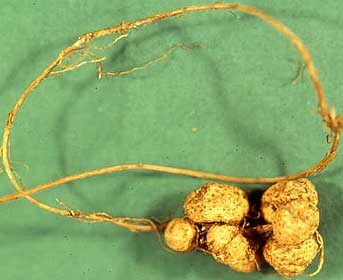 A new gall for the forest - the COTTON WOOL GALL Andricus quercusramuli (Asexual generation). A gall wasp. Photo: 29th April 2007 on English oak behind the café. 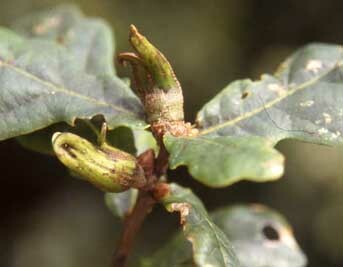 OYSTER GALL Agent: Neuroterus anthracinus Gall wasp (Asexual) attached to midrib of leaf of English oak. 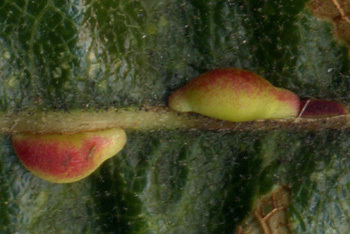 ACORN GALL Bulge on side of acorn of Turkey oak (left) . 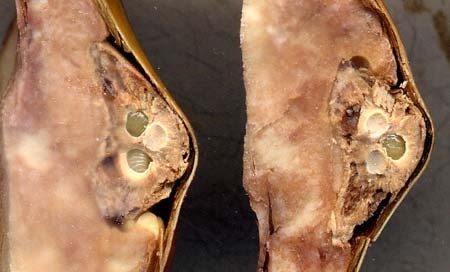 Acorn cut open to show internal gall and larvae (right). Photo: 13th November 2006. Dog Kennel Hill. Gall wasp Photographed 12th September 2005 on English oak. Previously known in Hampstead Heath and Regents Park. Recorded in Leyton 2004 (B. Wurzell) and Roding Valley (B. Ecott). An old gall and new ones found in the forest near the Refreshment Kiosk by members of the British Plant Gall Society on 24th July 2005. Gall wasp on male catkins of English oak. CATKIN GALL Agent: Neuroterus aprilinus (Asexual) Gall wasp on male catkins of English Oak. Photo: 9th May 2009.